Whether you are an owner of a cottage who is considering selling, or a prospective buyer, it is important to be as informed as possible on local market conditions. In my previous career as a managing director at a major Canadian financial institution, I developed a deep appreciation for the importance of sound analytics, and have applied these concepts to glean insights on broader market trends as well as individual property valuation. In an effort to promote greater transparency and efficiency in our local markets, I am pleased to provide monthly in-season statistics and commentary on each of the major lakes in our service area. 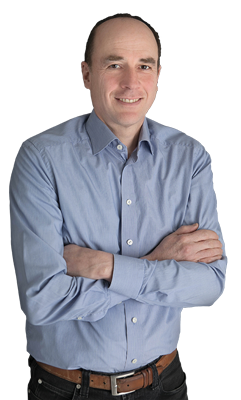 If you are interested in a more precise valuation of your property, please contact me at (705) 438-3000 or email me and I would be happy to provide a value estimate at no cost. The average sale price was $411,000 in 2018, down 10% from 2017. Ten properties were sold in 2018, in line with historical levels (except for 2016). One metric I track closely to provide insight into pricing trends is the Sale Price-to-MPAC Assessed Value Ratio. I calculate this ratio for each sale recorded, as well as an average ratio for all sales during the year. In 2018, the average ratio for the 10 Head Lake sales was 1.47, up slightly from the average ratio of 1.42 realized in 2017. The average ratio across the six key lakes in our region (Head/Shadow/Four Mile/Balsam/Cameron/Sturgeon) was 1.38, unchanged from 2017. These ratios support my belief that waterfront prices were stable year-over-year. Waterfront properties took much longer to sell in 2018 – the median number of days on the market for properties sold on the six key lakes in our region was 48 days, more than double the 2017 median of 23 days. On Head Lake, the median was 35 days in 2018 versus 17 days in 2017. My explanation for this increase is that buyers from the GTA who had experienced a double-digit percentage decline in their home values were expecting similar declines in cottage prices in 2018. Cottage sellers on the other hand were not willing to reduce prices in line with GTA trends due to their belief that “bubble” conditions were not evident in our market. This gap in pricing expectations was resolved largely in favour of sellers, as evidenced by stable year-over-year prices. The conventional wisdom that spring is the most active period for cottage sales was contradicted in 2018 – the post-September 1st market for waterfront properties in the western Kawarthas was much stronger than the pre-June 1st market. 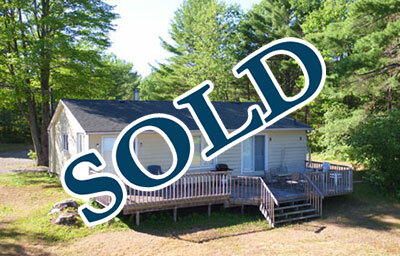 On Head Lake, only one property was sold prior to June 1st, while five were sold after September 1st. Buyers almost uniformly desire to use their cottages year-round – if you have a three-season property, it would be well worth your while to investigate the feasibility of enhancing it to four- season capability. Looking forward, I am hoping that the strong momentum from the fall 2018 market will carry into 2019. However, while the prospect of higher interest rates in 2019 appears to be receding, the late-2018 correction in financial markets has the potential to dampen buyer demand for waterfront properties. As always, real estate market conditions in the GTA will heavily influence our market. Sales activity has increased post-Labour Day. 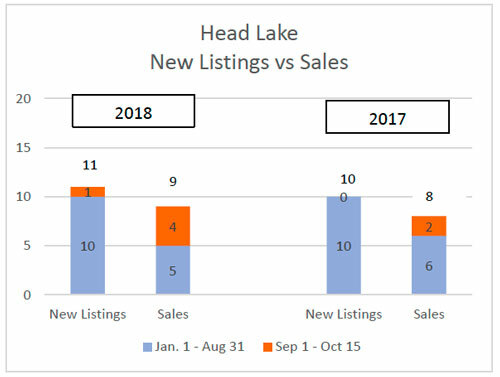 There have been four sales on Head Lake since September 1. Year-to-date listing and sales activity is now in line with 2017 levels. The average sale price for the 9 sales this year is $411,000, down from the $454,000 average price for all sales in 2017. The average Sale Price-to-MPAC Assessed Value ratio for the 9 sales so far this year is 1.49, up slightly from the 1.42 ratio realized for all sales on Head Lake last year. Listing and sales activity is in line with last year. 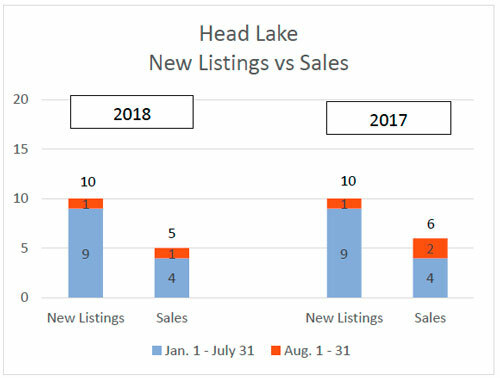 Since January 1, 2018, there have been ten new listings and five sales on the lake. This activity is in-line with the same period last year. The average sale price for the four sales this year is $386,000, down from the $454,000 average price for all sales in 2017. The average Sale Price-to-MPAC Assessed Value ratio for the eight sales so far this year is 1.49, up marginally the 1.42 ratio realized for all sales on Head Lake last year. Since January 1, 2018, there has been nine new listings and four sales on the lake. This activity is in-line with the same period last year. The average sale price for the four sales this year is $412,000, down from the $454,000 average price for all sales in 2017. The average Sale Price-to-MPAC Assessed Value ratio for the eight sales so far this year is 1.54, up from the 1.42 ratio realized for all sales on Head Lake last year. There are currently six active listings on Head Lake, with an average Asking Price-to-MPAC Assessed Value ratio of 1.54. Since January 1, 2018, there has been six new listings and three sales on the lake. This activity is in-line with the same period last year, when there were six new listings and four sales. There are not as yet sufficient data points to permit any meaningful comparisons of sales prices year-over-year. Listing and sales activity is off to a slow start in comparison to last year. Since January 1, 2018, there has been three new listings and only one sale on the lake. This activity is down from the same period last year, when there were five new listings and four sales. 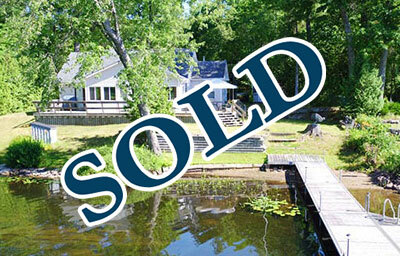 Since April 30, there has been one new listing and no additional sales on the lake. There has been very little activity on the lake so far in 2018, with only two new listings and one sale. This is no doubt attributable primarily to the late spring. Last year there were two new listings and three sales in the January to April period. The average sale price was $454,000 in 2017, up 19% from 2016, and 65% from 2014. Eleven properties were sold in 2017, down from a historically high level of 30 sales in 2016, but in line with pre-2016 levels. Market dynamics on Head Lake (and all of the Western Kawarthas) were influenced by events in the GTA housing market. The spring market was especially frothy, with large numbers of buyers competing for relatively few listings. Bidding wars were common. Cottage buyer interest receded somewhat after the imposition of the foreign buyer tax in the GTA. Mid-priced cottages continued to sell quickly, however, while sales of higher priced cottages slowed considerably. 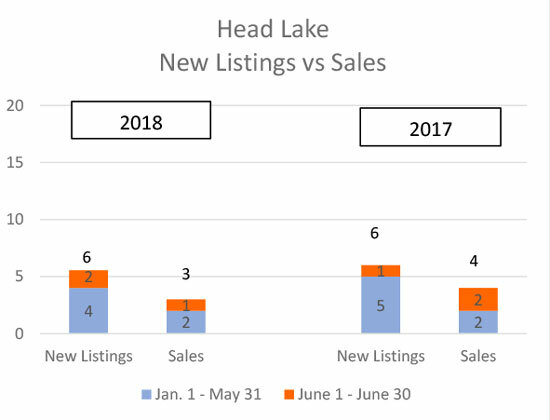 The trend to higher market values on Head Lake was supported by another metric we track closely – the Sale Price to Assessed Value Ratio. In 2017, the average ratio for Head Lake was 1.42, a 20% increase from the 1.18 ratio realized in 2016. Kawartha Waterfront Realty listed two of the three highest priced properties on Head Lake in 2017. One of these sales in October 2017 was a record high sale price for Head Lake. The average Sale Price to Assessed Value Ratio for the three properties sold by Kawartha Waterfront Realty on Head Lake in 2017 was 1.75, significantly higher than the 1.29 ratio achieved on the other eight sales (sold by a combined five other brokerages) in 2017. 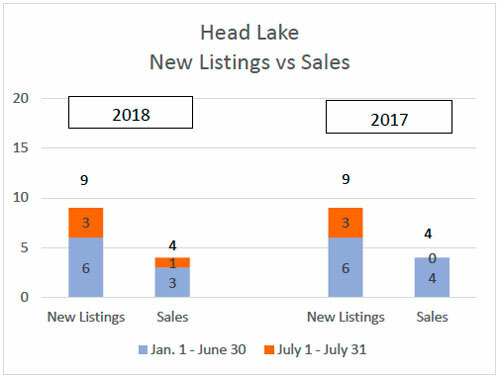 The 2017 trend on Head Lake towards higher average sale prices, higher Sale Price to Assessed Value ratios, and a relatively low volume of listings, is broadly consistent with trends on other lakes we track closely (Shadow/Four Mile/Balsam/Sturgeon/Cameron). We are short of Head Lake heritage photographs - please scan yours and email them to us!